It is convenient to describe the varieties of loose bodies under two heads: those composed of fibrin, and those composed of organised connective tissue. Fibrinous Loose Bodies (Corpora oryzoidea).—These are homogeneous or concentrically laminated masses of fibrin, sometimes resembling rice grains, melon seeds, or adhesive wafers, sometimes quite irregular in shape. Usually they are present in large numbers, but sometimes there is only one, and it may attain considerable dimensions. They are not peculiar to joints, for they are met with in tendon sheaths and bursæ, and their origin from synovial membrane may be accepted as proved. They occur in tuberculosis, arthritis deformans, and in Charcot's disease, and their presence is almost invariably associated with an effusion of fluid into the joint. 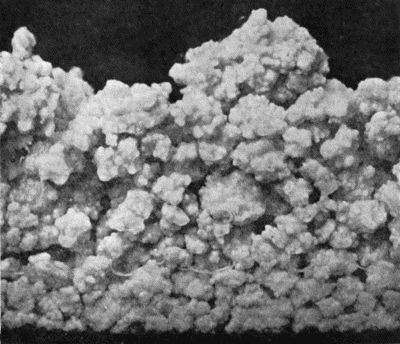 While they may result from the coagulation of fibrin-forming elements in the exudate, their occurrence in tuberculous hydrops would appear to be the result of coagulation necrosis, or of fibrinous degeneration of the surface layer of the diseased synovial membrane. However formed, their shape is the result of mechanical influences, and especially of the movement of the joint. Clinically, loose bodies composed of fibrin constitute an unimportant addition to the features of the disease with which they are associated. They never give rise to the classical symptoms associated with impaction of a loose body between the articular surfaces. Their presence may be recognised, especially in the knee, by the crepitating sensation imparted to the fingers of the hand grasping the joint while it is flexed and extended by the patient. The treatment is directed towards the disease underlying the hydrops. If it is desired to empty the joint, this is best done by open incision. Fig. 166.—Radiogram of Multiple Loose Bodies in Knee-joint and Semi-membranosus Bursa in a man æt. 38. Bodies composed of Organised Connective Tissue.—These are comparatively common in joints that are already the seat of some chronic disease, such as arthritis deformans, Charcot's arthropathy, or synovial tuberculosis. They take origin almost exclusively from an erratic overgrowth of the fringes of the synovial membrane, and may consist entirely of fat, the arborescent lipoma (Fig. 159) being the most pronounced example of this variety. Fibrous tissue or cartilage may form in one or more of the fatty fringes and give rise to hard nodular masses, which may attain a considerable size, and in course of time may undergo ossification. Like other hypertrophies on a free surface, they tend to become pedunculated, and so acquire a limited range of movement. The pedicle may give way and the body become free. In this condition it may wander about the joint, or lie snugly in one of its recesses until disturbed by some sudden movement. A loose body free in a joint is capable of growth, deriving the necessary nutriment from the surrounding fluid. The size and number of the bodies vary widely. Single specimens have been known to attain the size of the patella. The smaller varieties may number considerably over a hundred. Fig. 167.—Loose Body from Knee-joint of man æt. 25. Natural size. a = Convex surface. b = Concave surface. In arthritis deformans a rarer type of loose body is met with, a portion of the lipping of one of the articular margins being detached by injury. 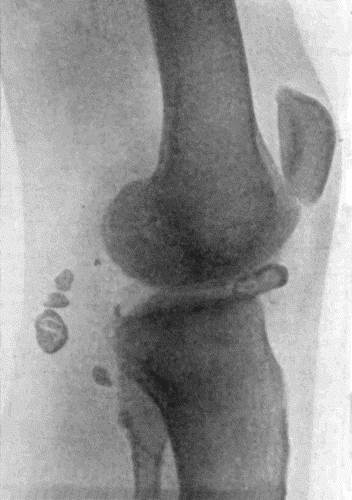 In Charcot's disease, bodies composed of bone are formed in relation to the capsular and other ligaments, and may be made to grate upon one another. The clinical features in this group are mainly those of the disease which has given rise to the loose bodies, and it is exceptional to meet with symptoms from impaction of the body between the articular surfaces. Treatment is to be directed towards the primary disease in the joint, as well as to the removal of the loose bodies. Fig. 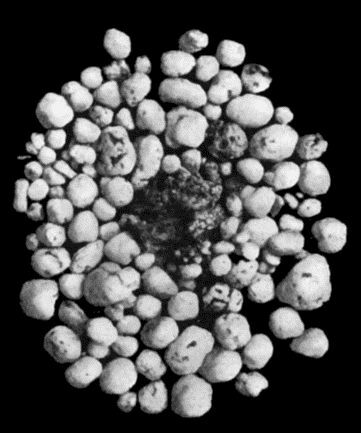 168.—Multiple partially ossified Chondromas of Synovial Membrane, from Shoulder-joint, the seat of arthritis deformans, from a man æt. 35. Loose Bodies in Joints which are otherwise healthy.—It is in joints otherwise healthy that loose bodies causing the classical symptoms and calling for operative treatment are most frequently met with. They occur chiefly in the knee and elbow of healthy males under the age of thirty. The complaint may be of vague pains, of occasional cracking on moving the joint, or of impairment of function—usually an inability to extend or flex the joint completely. In many cases a clear account is given of the symptoms which arise when the body is impacted between the articular surfaces, namely, sudden onset of intense sickening pain, loss of power in the limb and locking of the joint, followed by effusion and other accompaniments of a severe sprain. On some particular movement, the body is disengaged, the locking disappears, and recovery takes place. Attacks of this kind may recur at irregular intervals, during a period of many years. On examining the joint, it is usually found to contain fluid, and there may be points of special tenderness corresponding to the ligaments that have been overstretched. In cases in which there has been recurrent attacks of locking, the ligaments become slack, the joint is wobbly, and the quadriceps is wasted. The patient himself, or the surgeon, may discover the loose body and feel it roll beneath his fingers, especially if it is lodged in the supra-patellar pouch in the knee, or on one or other side of the olecranon in the elbow. In most instances the patient has carefully observed his own symptoms, and is aware not only of the existence of the loose body, but of its erratic appearance at different parts of the joint. This feature serves to differentiate the lesions from a torn medial meniscus in which the pain and tenderness are always in the same spot. As the body usually contains bone, it is recognisable in a skiagram. Fig. 169.—Multiple Cartilaginous Loose Bodies from Knee-joint. There are two methods of removing the body; the first and simpler method is applicable when the body can be palpated, usually in the supra-patellar pouch; it is preferably transfixed by a needle and can then be removed through a small incision; otherwise, the joint must be freely opened and explored, firstly to find the body and further to remove it. The characters of this type of loose body are remarkably constant. It is usually solitary, about the size of a bean or almond, concavo-convex in shape, the convex aspect being smooth like an articular surface, the concave aspect uneven and nodulated and showing reparative changes, healing over of the raw surface, and the new formation of fibrous tissue, hyaline cartilage and bone, the necessary nutriment being derived from the synovial fluid (Fig. 167). The body is sometimes found to be lodged in a defect or excavation in one of the articular surfaces, usually the medial condyle of the femur, from which it is readily shelled out by means of an elevator. 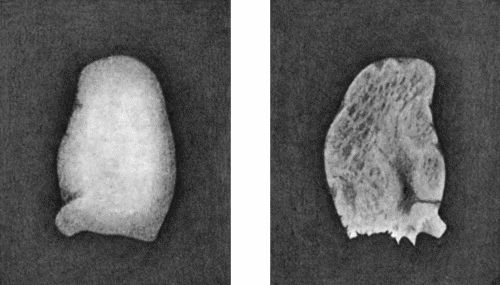 It presents on section a layer of articular cartilage on the convex aspect and a variable thickness of spongy bone beneath this. Multiple Chondromas and Osteomas of the Synovial Membrane.—In this rare type of loose body, the surface of the synovial membrane is studded with small sessile or pedunculated tumours composed of pure hyaline cartilage, or of bone, or of transition stages between cartilage and bone. They are pearly white in colour, pitted and nodular on the surface, rarely larger than a pea, although when compressed they may cake into masses of considerable size. With the movements of the joint many of the tumours become detached and lie in the serous exudate excited by their presence. They are found also in the diverticula of the synovial membrane, in the shoulder in the downward prolongation along the tendon of the biceps, in the hip in the bursal extension beneath the psoas. The patient complains of increasing disability of the limb, movements of the joint becoming more and more restricted and painful. There is swelling corresponding to the distended capsule of the joint, and on palpation the bodies moving under the fingers yield a sensation as of grains of rice shifting in a bag. If the bodies are so numerous as to be tightly packed together, the impression is that of a plastic mass having the shape of the synovial sac. The stiffness and the cracking on movement may suggest arthritis deformans, but the X-ray appearances make the diagnosis an easy one. We have observed two cases of this affection in the knee-joint of adult women, one in the shoulder-joint of an adult male (Fig. 168), and Caird has observed one in the hip. The treatment consists in opening the joint by free incision and removing the bodies. Displacement of the menisci of the knee is referred to with injuries of that joint.